On, November 19th, I attended a Gastronomic Demonstration with Kelly, given by Chef Jacques Fox at the Briarcrest Country Club. A little about Chef Fox, he was born in North Africa and raised in France by Polish Parents. He attended culinary school in Tulle, France, then arrived in Paris to work at Maison Prunier. After leaving Paris, Chef Fox became the Executive Chef for Club Mediterrranne ("Club Med")working at resorts in Sicily, New Caledonia, Haiti,Maldivies Islands, Greece,Israel and the United States. 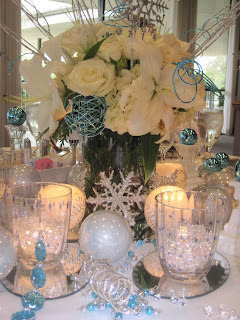 Chef Fox was the Executive Chef for the Briar Club in Houston, and most recently Miramont Country Club in Bryan, Texas. 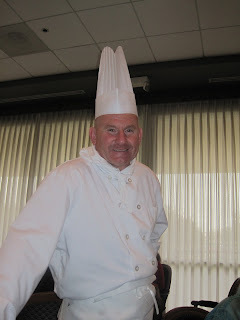 He is currently the Executive Chef/Director of Food and Beverage at the Briarcrest Country Club. Now, on this day we would be learning to prepare: Cream of Cauliflower, Pistachio Crusted Sea Bass, and Chocolate Truffle Cake. 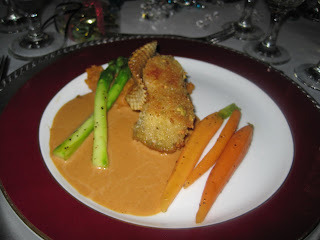 Later for lunch we were served: Cream of Cauliflower, Baked Butternut Squash Soup with Fried Shrimp, Pistachio Crusted Sea Bass,Sauce Armoricaine, Mashed Sweet Potato, Asparagus, Baby Carrots, Chocolate Truffle Cake with Almond Sugar Cookie and Fruit Tartlet Creme Anglaise. It was yummy and very very very rich, portions need to be small. If you can make my Creme Brulee, you can make this. Don't be scared. 3. Place chocolate, sugar, butter and coffee together in double boiler. Melt chocolate slowly in double boiler. 4. In a separate bowl, beat eggs until they are well mixed. 5. Add eggs to melted chocolate mixture, whisking constantly. 6. Pour mixture into ramekins. 8. Cool overnight and cut into pieces. 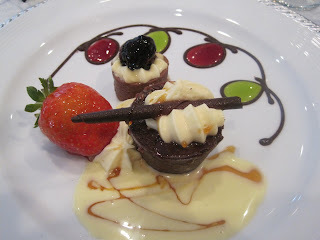 Serve on plate with raspberries and chocolate sauce.